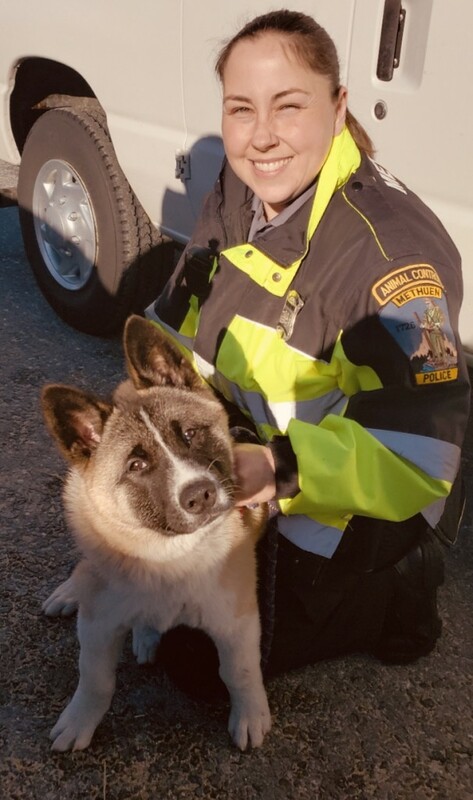 METHUEN — Chief Joseph Solomon is pleased to highlight the recent successes of the Methuen Police Department’s Animal Control Officer. In just the last several weeks, Methuen Animal Control Officer Renee Falardeau has reunited two lost pets with their families, including one who was missing for months. In early December, ACO Falardeau responded to a call about a stray cat near a residence on Sandra Lane. Upon arrival, she immediately recognized the cat — Fluffy — as one that had been reported missing by its owners in early July. She then quickly made contact with Fluffy’s owners and subsequently returned her to her family. On Tuesday, Jan. 15, a resident brought a small white dog to Animal Control, and ACO Falardeau exhausted all options to try to locate the dog’s owner, including checking the dog’s microchip — which contained outdated information — and turning to social media. A good Samaritan volunteered to hang posters, which ultimately led to his owners being located and reunited with their pet. “Our Animal Control Officer does a lot of great work, including reuniting families with their beloved pets,” Chief Solomon said. ACO Falardeau joined the Methuen Police Department in October 2017 after working for the MSPCA at Nevins Farm, focusing on animal welfare. She also recently completed the 13-week Animal Control Officers of Massachusetts Academy. The Animal Control Officer maintains a Facebook page, which features local events and updates on missing animals, as well as a variety of engaging tips and important facts for residents. Methuen Animal Control can also be reached by phone at 978-983-8670.